The land is of collective use and property of the state. Most of the locals’ income comes from handicrafts, a few agriculture production. They are used to fish with “Pari”, a trap made with bamboo to catch fish, which is then usually cooked roasted with corn, a basic food item for these communities. We aim to introduce fish farming as an activity that will contribute to food security and enhance fish consumption in Rio das Cobras Indigenous Land to 12 kg.person.year and enable youngsters from these communities to learn and share best management practices of fish farming production within the community. The main result is the implementation of fish farming as an activity in the communities. A system of harvesting and stocking procedures will be going on for at least two more years as well as training courses for students. In terms of capacity building this project has allowed members from the Rio das Cobras Indigenous Land to have greater involvement with the University and develop applied research within their territory. Betina Muelbert, Maude Regina de Borba, Marcos Weingartner and Cristiano Augusto Durat are Professors at Universidade Federal da Fronteira Sul, Brazil with experience in freshwater fish production systems, nutrition, reproduction and Indigenous History, respectively. Ilda Cornélio holds a Master in Agroecology and Sustainable Rural Development and is a resident of the Rio das Cobras Indigenous Land. Brazil has immense ethnic and linguistic diversity with a population of Native Americans of 896,000 people within 305 ethnical groups. In the southern state of Paraná there are about 25,000 living in 32 Indigenous Lands (IBGE, 2012). Nutritional deficiencies are causes that endanger several indigenous peoples across the world (UN, 2009) and is not different in Brazil. Aim to promote food security of indigenous peoples, fish farming comes as a valuable alternative, as it is considered an activity that can reduce hunger and improve the nutritional quality of rural families in different countries (Kubitza and Ono, 2010). Moreover, fish is one of the most balanced sources of protein in terms of essential amino acids, rich in minerals and fatty acids fundamental for human nutrition (FAO, 2016). Universidade Federal da Fronteira Sul (UFFS) is a public institution in the South of Brazil founded in 2010 with most activities focused on regional sustainable development. It is located within an agricultural region characterized by small family farms and low development indexes (Christoffoli et al., 2016). A large reserve is located within this region, Rio das Cobras Indigenous Land, occupied by the Kaingang and the Guarani Mbya ethnic groups. This indigenous land has been a site of research, outreach and education actions since the installation of the University. Within one of the projects run by UFFS, we have been developing a fish farming in the reserve. This project started in 2014 as an initiative from lectures in the courses of Bachelor in Aquaculture Engineering and the Master program in Agroecology and Sustainable Rural Development and it was funded by the Brazilian Ministry of Education (ProExt MEC). The Fish farming project initiated as a consequence of the demand from the local community. Fish is an important part of Rio das Cobras Indigenous Land´s food habits. Most of the fish consumed by these communities come from fishing, however catches have decreased rapidly due to water pollution. In this case, fish farming can be an important source as fish growth in ponds can be managed and controlled. Rio das Cobras Indigenous Land (latitude 25° 18’S and longitude 52° 36’ W) is located in the municipalities of Nova Laranjeiras and Espigão Alto do Iguaçu, State of Paraná, Brazil and has an area of 18,680 hectares. It was declared indigenous territory by the national government in 1949 for exclusive and communal use of the aboriginal group. The natural vegetation within the Rio das Cobras reserve is formed manly by Subtropical Mixed Forest, also called Araucaria Forest. Four small rivers cross the area, Rio das Cobras, Pereira, Guarani and Rio da União, belonging to the hydrographical region of the Iguazu river basin. The climate in Mid-South region of Paraná is Cfb (humid mesothermal subtropical) according to Köppen’s classification, average temperatures recorded per year is 19 °C and rainy index of 1,500 millimetres per year with mean temperatures above 24ºC in the warmest month (January), and between 13 and 15ºC in the coldest (July). The population within the Rio das Cobras reserve is approximately three thousand people in eight Kaingang and two Guarani Mbya communities and a total of seven schools and 1,500 students (Cornelio, 2017). The land is of collective use and remains property of the state. The population here face difficulties on income gain to meet basic needs and food production is scarce. Most of the locals’ income comes from handicrafts, a few agriculture production, services and social security government assistance. They are used to fish with “Pari”, a trap made with bamboo to catch fish, which is then usually cooked roasted with corn, a basic food item for these communities. Mineiro (2017) described Rio das Cobras public schools meals and found that they prepare imported Pollock, purchased frozen by the government. This author also showed that food habits have been changing and processed food bought from the markets are common in daily life. Coupled with that fish produced in ponds can provide animal protein and income to households. Moreover, fish ponds provide many benefits to human-nature relationships such as livestock watering, irrigation, swimming, and wildlife enhancement. We aim to introduce fish farming as an activity that will contribute to food security and enhance fish consumption in Rio das Cobras Indigenous Land to 12 kg.person-1.year-1 and enable youngsters from these communities to learn and share best management practices of fish farming production within the community. Additionally, using a polyculture system with mainly native species, in partial substitution to exotic tilapia and carps, we also manage to insert a more sustainable technology with exchange of intercultural knowledge among the academic and local community. Furthermore we intend to increase the knowledge and understanding of socio-ecological fish production in the area. Fish farming project activities are develop in a continuous dialogue with the community and mostly through their leader, called Cacique. We have regular meetings either at the University or at the Indigenous Land when we discuss the goals and exchange ideas such as in which community to implement the project and who should be involve. Here we describe our activities in the communities of Sede, Trevo, Campo do Dia, Vila Nova and Lebre in the 2014 -2017 period. 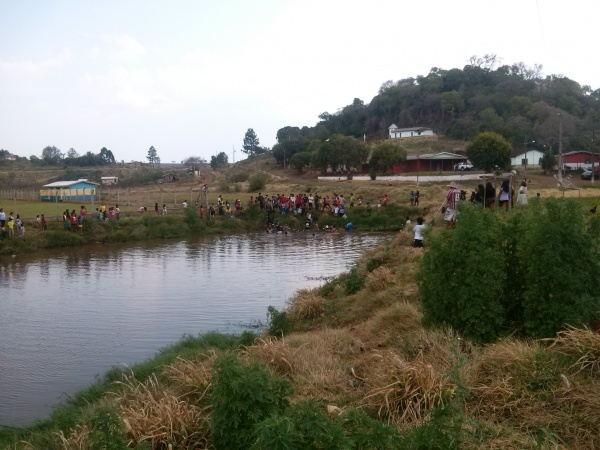 A series of improvements in terms of repairing old ponds and installing new ones were achieved by working in collaboration with the community. This includes the restoration of three ponds that were abandoned – the ponds were repaired, vegetation within the pond was removed and drainage structures were built. A local indigenous constructor built the monk, which is a drainage concrete structure at the pond outlet closed by two parallel pieces of timber with clay packed in between (Figure 1). Three new excavated ponds were constructed in areas of flat land. The construction of a new pond requires the removal of great quantities of soil allowing water to fill in the dugout area. Most of the water supply comes from ground water seepage or natural springs. We installed PVC pipes and monk for outlet. It was decided to implement a polyculture system where fishes from different species and with different feeding habits are combined. Omnivorous, herbivorous and filter feeders are ideal in this system, as this combination allows for interactions and the consumption of natural food available in the pond, resulting in a best use of resources. Fish polyculture systems in southern Brazil occur mainly in small scales farms with a mixture of common carp Cyprinus carpio, silver carp Hypophthalmichthys molitrix, bighead carp Hypophthalmichthys nobilis and grass carp Ctenopharyngodon idella. Recent studies have tested the introduction of different species such as silver catfish (Rhamdia quelen) and Nile tilapia (Oreochromis niloticus) (Barcellos et al., 2012). The polyculture system we established in the five communities were very similar, being a combination of native species, such as silver catfish R. quelen, curimba Prochilodus lineatus, Lambari Astyanax sp., Pacu Piaractus mesopotamicus and in a smaller quantity common carp C. carpio, silver carp H. molitrix, bighead carp H. nobilis and grass carp C.idella. The ponds characteristics are presented in table 1. Table 1 –Detail description of each fish pond in Rio das Cobras Indigenous Land. Total stocking density was 1 fish.m–² with an average final production of 0.3 kgm–², characterizing a semi-extensive system. Fish were fed supplementary with commercial diets, supplied five times a week by community members. Supplementary feeding in polyculture is important to enhance yield as natural feed is usually not sufficient in this level of stocking density. Besides harvesting at the end of the growing period, two fishing tournaments were promoted for integration with the community and stimulate fish consumption (Figure 2 and 3). It is well known that most freshwater fishes are highly sensitive to alterations to a series of parameters of water quality. For this reason, water quality of fish ponds was monitored monthly (Figure 3). The water temperature (oC), dissolved oxygen (mg L-1), ammonia (mg L-1), pH, total alkalinity (mg CaCO3 L-1), total hardness (mg CaCO3 L-1) and water transparency (cm) were measured in loco with thermometer and colorimetric tests using an Aquaculture Kit and a Secchi disk for transparency. These equipment are very simple to use and allows assessing whether the conditions are adequate for fish production. In addition, training courses were given involving high school students. The educational process was organized by undergraduate students from UFFS supervised by the academics. It was structured in six theoretical-practical hands on session on basic fish farming topics such as best management practices, water quality, fish nutrition and health management (Figure 4). For this purpose a guide on fish farming was developed, with information presented in a simple and easy-to-understand form, which will be translated into Kaingang and Guarani language. The main result is the implementation of fish farming as an activity in the communities. The case is ongoing, two more fish ponds are being established and we plan to stock fingerlings (small young fish) in these new ponds and continue with harvesting and stocking procedures for at least two more years as well as with the courses for students. In terms of capacity building this project has allowed members from the Rio das Cobras Indigenous Land to have greater involvement with the University and develop applied research within their territory. We provided a scholarship to a high-school student of the community to collaborate in the project. Additionally, Ilda Cornelio, one of the authors of this report and member of the Rio das Cobras community, developed her Master thesis in Agroecology and Sustainable Rural Development at UFFS, analysing the domestic waste situation of the reserve. It is important to mention that she granted the position in the Masters course thought affirmative actions. During the three years of the project we faced some logistic issues. Particularly, we were not informed about the drainage of some ponds in 2017. As this happened during the period of leadership changes. Additionally, we were unsuccessful in growing fish during 2015 and 2016 in one pond which faced problems of water loss due to seepage. All these minor issues are under control and ponds are in good condition for fish farming. Despite these limitations the work represents a major advance in current practices and we hope that this will stimulate further production activities within the community. BARCELOS, L., J. G.; QUEVEDO, R.M. ; KREUTZ, L.C. ; RITTER, F.; PANDOLFO, A.; HEMKEMEIER, M.; COLLA, L. 2012 Comparative Analysis of Different Fish Polyculture Systems. Journal of the World Aquaculture Society, 43(6): 778-789. CHRISTOFFOLI, P.I. ; LEANDRINI, J.A. FRANZENER, G. MARTINS, S.R. ; TREVISOL, J.V. Experiência do Mestrado em Agroecologia e Desenvolvimento Rural Sustentável da Universidade Federal da Fronteira Sul. In: PEDRO, J.M. ; FREIRE, P.S. Interdisciplinaridade: Universidade e inovação social e tecnológica. Curitiba: CRV, p.119-132, 2016. IBGE. Características Gerais dos Indígenas. Resultados do Universo. Censo Demográfico 2010. Rio de Janeiro: Instituto Brasileiro de Geografia e Estatística, 2012. KUBITZA, F.; ONO, F. Piscicultura familiar como ferramenta para o desenvolvimento e segurança alimentar no meio rural. Panorama da Aquicultura, Rio de Janeiro, v. 20, n. 117, p. 14-23, jan/fev., 2010. UN, United Nations Organization. State of the World’s Indigenous Peoples. New York, 2009. Available in: <http://www.un.org/esa/socdev/unpfii/documents/SOWIP/en/SOWIP_web.pdf>.